The Arturia Keylab 49 Essential Keyboard Controller includes a full-fledged DAW control area and a central screen section allowing instant access to the 5000-plus Analog Lab 2 presets included. All the knobs, sliders and pads one could dream of are available right at your fingertips and 8 mappings assignations can be selected in the blink of an eye. KeyLab Essential will sit beautifully in the center of any music making arsenal. 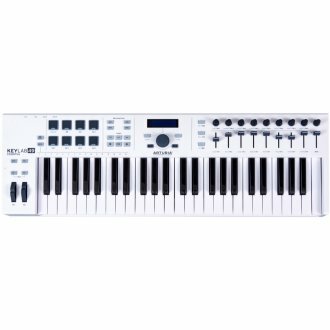 Featuring a full-sized, synth-action 49-Key keybed, its convenient light weight doesn't take anything away from its sturdy feel. Comes with Ableton Live Lite, UVI Grand Piano Model D and Arturia's award winning Analog Lab 2. - Select sounds, browse presets, switch parts, smart-assigned controls. - Standalone or plug-in operation: VST, VST3, AU, AAX. - Ableton Live 9 Lite - record, layer, and edit your sounds to create a finished song. - UVI Grand Piano Model D - Sample-based software recreation of Steinway classic. Available until 11 PM (EST) today. Mention special code 1ZQ-8TLN when you call.